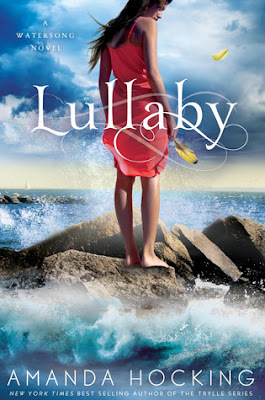 Magical Urban Fantasy Reads: Wake & Lullaby by Amanda Hocking Signed Books Giveaway! Wake & Lullaby by Amanda Hocking Signed Books Giveaway! While Harper searches for her sister, Gemma struggles to adjust to her new life. Gemma's powers are growing by the day, and the longer she lives with her new "sisters," the harder it is to resist entering their magical world. It's a realm both dark and beautiful, and where she's plagued by strange hungers and unspeakable needs. Just as she's drifting far away from her old life, Harper and Daniel find her...but no one can deny how much she's changed. All she wants is to return to her family and the mortal world, but how can she do that when she's become something else entirely—and will they still love her once they learn the truth? 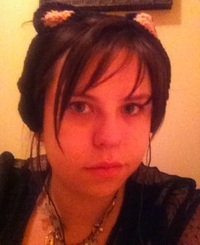 This giveaway is donated by the totally AWESOME Rachel from Fiktshun! After you've entered this awesome giveaway, head on over to Fiktshun! She's hosting a giveaway too!!! This giveaway is open to US Shipping Only! I have all the books in the Trylle and am going to binge read them when my TBR pile isn't so high. I loved the Trylle Trilogy. I read them back when she self published them! Can't wait to dive into this series! I definitely want to read Trylle! I've read the first book, Switched, in the Trylle series! I have Torn and Ascend on my TBR shelf! I have yet to read any of her books but I love everything I have heard! Can't wait to get started on these,t hey sound amazing!!! I haven't read any of them yet, but they are all on my list of things to read! I think the Watersong series appeals to me most since I was born near one ocean and live near another one now. Thanks for the giveaway. I haven't read any of her books yet but am so intrigued with the Watersong books! I really want to start with those! I havent read any of her books yet but I would love to read both series especially Watersong. Thanks for the giveaway. I loved The Trylle series. I am Looking forward to finishing Wake, but so far in hooked. I love the cover of these books. I haven't heard of this series before but I do plan on reading now. Thanks! I'm more excited to read the watersong series! It seems so cool and interesting. I have read both Switched and Torn of the Tryll Trilogy and look forward to reading Ascend, I can't wait to read the Watersong series. I loved the Trylle, Hollows, and My Blood Approves series'. I haven't read the Watersong series yet, but I'm looking forward to it! I've only read the first book in the Trylle series but enjoyed it. I can't wait to read the rest of the series and all of her other books! Thank you! 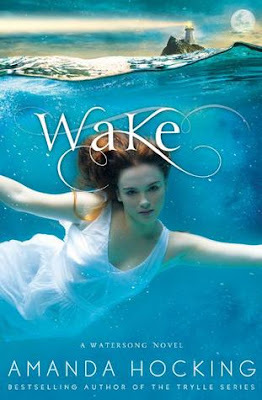 Both the Trylle and Watersong series are on my TBR list and I am super excited about both, but I LOVE the cover for Wake and have wanted it so bad for what seems like forever!!! Thanks for the great giveaway I have wake on my ereader and haven't read it yet but I'd love the book copy better thanks for the giveaway!! I've actually never read any of her books, but I think I'm more excited to read Watersong. Thanks for the giveaway! I actually haven't had a chance to read any of her books yet! I'm excited to read all of them! I cannot wait to get started on this series! 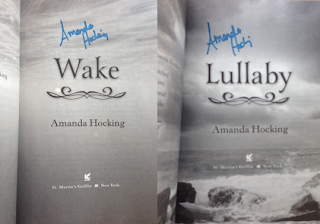 Amanda Hocking is one of my faves for sure! Thanks for sharing this giveaway! I love the Trylle series and Hollowland. I can't wait to read Wake.